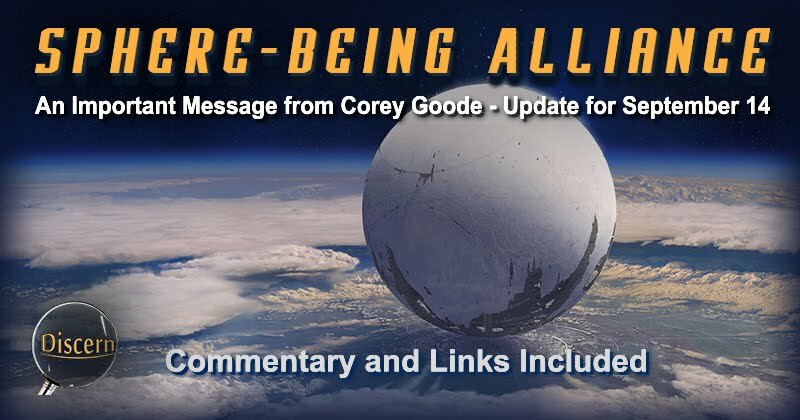 This is an update which was posted by Corey Goode to the Sphere-Being Alliance Facebook page, and is on the subject of false SSP whistleblowers. It is honestly good to receive this news and to be informed of future issues that may arise, though it is not very preferable to have fraudulent testimony by any number of people. The subject of the Secret Space Program and ET contact are two of the most important subjects to discuss at this point. Consequently, there is little or no room for disinformation or misinformation on these topics. However, it does show that these subjects are well-known enough that people are paying attention. However, as we've seen, sometimes this information does not always receive the most preferable kind of attention. Here is Corey Goode with more on the subject. FYI, Beware of some of the newer "SSP" whistleblowers that have come forward recently. They are mostly mixing their imaginations with the data I have released. There are a lot of people trying to bend the info I have released into their own belief systems and UFO religions. They just have to make this new info fit into their currently held belief systems. All I can say is put on your discernment filters more now than ever. One person in particular, is making the rounds of Radio and TV Shows trying to get booked for interviews and are popping up in YouTube videos like crazy right now. This will only add to the disinformation and confusion on the SSP and SBA subjects as people are having more and more true encounters with these beings. Due to my own experiences with abduction, I understand that at some point, there is the desire to speak extensively about these otherworldly encounters. However, the prospect of ET contact is not always what a person desires to discuss in a public setting. The memory of when I first learned of my own abduction experiences is still fresh in my mind. There was so much stress and anxiety that came along with the entire ordeal that at one point, I was tempted to delude myself and pretend that I was "chosen" for some higher purpose. I was convinced that I was "worthy" and that it was only due to my "strength" that I was given such painful and traumatic experiences to deal with. However, this was only a defense mechanism (as well as a conditioned response induced by outside parties). What can a person due when face with such a horrendous ordeal as military abduction with little of no idea of how to solve it? (There is, of course, an answer, though I did not know it at the time.) It is not my intent to excuse these people for lying and telling stories. Rather, I want to give people a perspective of some of the motivating factors behind some of the false testimony we may hear. The bottom line is if a person is truly in touch with positive beings and has a positive service-to-others focus, they will have no place for ego or bragging of any kind. To add, if a person is actually aware of the reality of their negative experiences, it is not likely that they will want to talk about them (at least not initially). (This is also a conditioned response that may be induced and maintained throughout the military abduction process.) Both from personal experience and from the testimony of others who have come to me with stories similar to my own, the life-long experience of abduction does not come up in conversation without an extremely good reason behind it. There are plenty of ways to get attention besides the difficult task of sharing such personal ordeals. So when we see people sharing ego-oriented information, and telling unfounded stories without presenting verifiable evidence, we will know to think twice before buying into such stories. If nothing else, this should be a great exercise in discernment for us all.